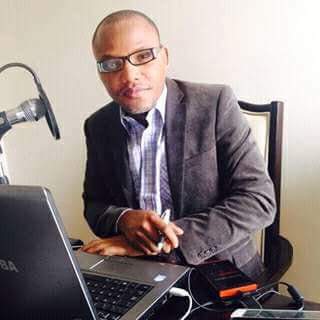 After a clear assessment, interview and investigation, the leadership and writers of The Biafra Post known as ‘Biafra Reporters’ have named Nnamdi Kanu their 2016 Man Of The Year. This award is a product of critic aimed at making a better world for African children and setting the pace against neo-colonialism which has hampered African growth. This award is also to foster and build the sense of being a human into Nigerians and Africa at large. Let’s join Nnamdi Kanu to say no to Experimented human beings; Biafra shall be free through which Africa will be emancipated. To the man that fought a cause without any form of violence and achieved much even without a gunshot we lift. The chilling morning breeze from the mountain; a tiding that brings a feeling down your spine, Romeo and Juliet are on a walk, feeling the flowers, the lawn and the blossoming grapes. The morning chilling breeze fades away; pursued by the weak sunshine of the noon and in the night; the chilling breeze comes knocking at your door again. You would boast and question its right to disturb you; your Juliet is lying like a rose and she would chase away the chilling breeze that leaves you frozen. But a man sits in the lush of the cold; the hotness of the day he knows - a lone and negatively serene place. He would look over his shoulder and see a wall, looks to the left and see a wall, to right and he sees it. He talks to himself alone; the walls and the bed stare at him, life is the ability to be free, even death consigns men to a prison. We live to avoid death; but a prison is a harsher death, a man that lives his death for his people, o! Shall I compare him to what? O! Africa; will they learn from Nnamdi Kanu the ways of a leader? I recently read a piece titled ‘The Price of Wanting to Be A hero’ published by Naij.com a Nigerian online news website. The author poorly questioned the commitment of Nnamdi Kanu; he was quick to posit that while others are enjoying their festive period Nnamdi Kanu chose suffering. He was of the view that Nnamdi Kanu should call off his quest because at the end; Biafrans will only protest and after which life will go on, he cited MKO Abiola. The author significantly has poor knowledge of history; by virtue of such comparison he is either not grounded or lacking historical facts. MKO Abiola is a politician pursuing his personal career or rather selfish interest. Politics in Nigeria is all about interest; so for Abiola to be a victim of his political ambition, I see no reason people should respond fanatically. Abiola is not an indigenous leader, he could be said to be a political leader just as Goodluck Jonathan was to Biafrans. Had anything happened to Goodluck in the course of his political ambition; reaction will pour in and political settlement will douse the tension. When we see the Indigenous People of Biafra dying because their leader is in detention; what will happen if anything happens to their leader? Nnamdi Kanu is a leader that has taught his people how to die fearlessly for Biafra; permit me to say that he showed and the people followed. Whatsoever that is happening today or will happen tomorrow in Biafra; Nnamdi Kanu has done it or showed it and the people follow, that is the definition of leadership. Nnamdi Kanu has died for Biafra and this is why Biafrans join him and die; Nnamdi Kanu has given everything for Biafra and this is why Biafrans will give everything and beyond the ultimate price. Nnamdi Kanu tamed and taught Biafrans what leadership is; he programmed Biafrans to their souls that even the spirit of dead Biafrans keep fighting for Biafra restoration. No prevarication or retreat; there must be victory in the end and no barrier is worth stopping Biafra. His continued incarceration has not stopped him and neither has threat to kill him stopped him, the promise for gold and silver did not deter him and that same way his over 70 million followers remain grounded. Nnamdi Kanu has made fanatics out of exemplary leadership; if three to four leaders in Africa can be like him; Europeans and Asians will seek for visa to come into Africa as we scramble to go to their continents. There would be less death of Africans trying to cross the Mediterranean Sea on daily basis; if only Africa could learn from Nnamdi Kanu, the continent will no longer be European dumping area. The aforementioned author failed to see that Nnamdi Kanu is only exotic and extra-ordinary leader which is quite different from African culture of leadership that anchors on commanding-leadership and not serving-leadership. The author was amazed how a leader suddenly chose to die and suffer for the people that he questions the act. This act Nnamdi Kanu embraced that African leaders fear so much is what is holding Africa down. Any day leaders learn to lay down their lives for their people no matter how unworthy the people are, then the people will learn to die for their leader and continent, learn to make their countries great and fix problems with their lives. There must be sacrifice for a better future; that Europe and other continents are developed; there were sacrifices and that Africa fear so much. On the second running for the year; Nnamdi Kanu is the most published leader in Africa- a prisoner of conscience that have remained resolute. Muhammadu Buhari might have contributed to the fame and world propagation of Nnamdi Kanu due to his bigotry that has received resistance and tenacity but the bottom line is Nnamdi Kanu needed mental toughness to have reached the height he-Biafra is today. The world is speaking and mentioning Biafra which has never been the case since 1967; the people are raising Biafra flag everywhere in the world, Biafra is no longer a name mentioned in secret in Nigeria. Nnamdi Kanu and IPOB have achieved so much that history will have them as the best thing that has ever happened to Africa. Release Nnamdi Kanu and adopt globalization which is epitome of civilization in solving Biafra question. He has peacefully anchored agitation for the restoration of Biafra; he released not a single shot in the air let alone at human being. He attacked nobody with bare hands let alone weapon; he is an activist thriving on voice of reason. He deserves accolades for being the first man to fight a cause in Africa without any form of violence. The prison is meant for law breakers and not a law-abiding person like Nnamdi Kanu. Release Nnamdi Kanu now because peace goes for peace and violence goes for violence. While anybody can wake up and talk without knowing that Nnamdi Kanu can cause untold havoc- have the power to declare war. He can issue a command and millions will give their lives as they were ready to do with Buhari in Enugu State. He is the very man holding already impatient and fragile Biafrans to stay peaceful and can leave them any moment. He has maintained peace and shown extra-ordinary perseverance. He has endured all provocations and shown the doggedness of a leader. He has continued to show the difference between African mentality and European mentality. All these marks made him Biafra Reporters 2016 man of the year.